In this article we will go over selecting and assigning Issue types for a property from Silvertrac's pre-existing list of common Issue Types, or how to add a New Issue Type. 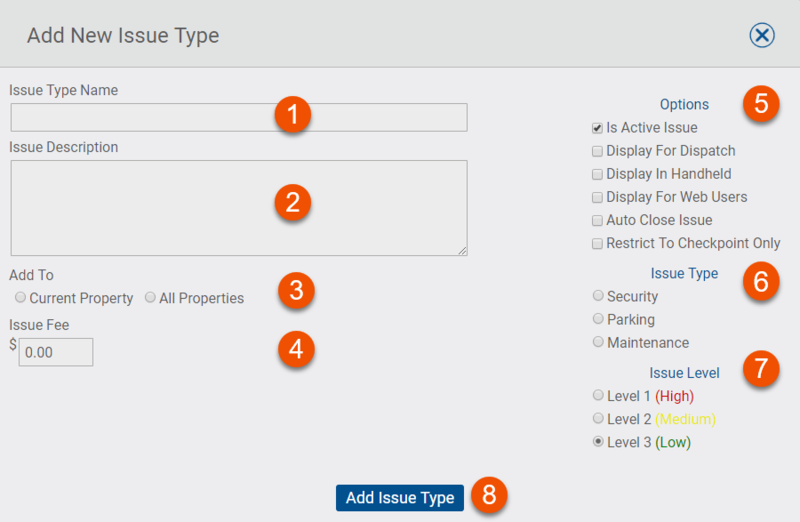 We will also review how to assign an Issue Type to the Current property you are working on or to All Properties, go over user options of Issue Types, how Issue Types appear in the issue monitor and how to classify the level of an Issue Type. Silvertrac pre-populates a list of several commonly reported issues. There is a Select All/None option at the top of the page to quickly add all of the issue Types with a check-mark which indicates that the issue(s) will be active to report on that property. You can also scroll through the existing list of issue types and check just the issues types that are applicable to the property. If you do not see an applicable Issue Type you can manually create your own Issue Types by clicking the Add New button. 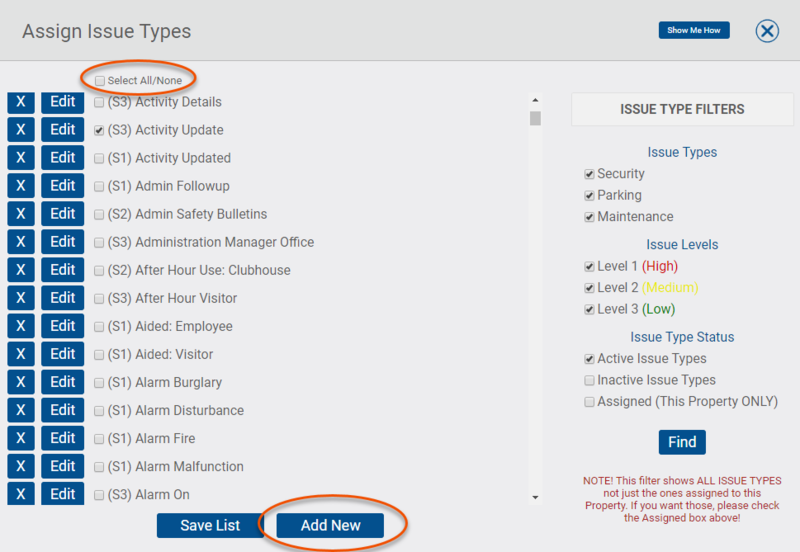 Once you have selected the desired Issue Types for the Property click Save List. Each option is assigned a number 1-8 and a detailed explanation is included in the corresponding number below in the screen shot. Type in an Issue Type Name. The Issue Type Name will display this same way in the issue monitor, reporting devices, and reports. (Optional) Issue Description area is for internal use only. This info is only here as a reference to define the issue if any confusion exists as to why it was created. Assign the new issue type to the Current Property or to All Properties. NOTE: When adding issue types and selecting ALL Properties, the newly created issue type will attach to all pre-existing properties in the site. (Optional) Issue Fee field is only used when the advanced parking module is being used at a property. Display For Dispatch: Opens the issue type access for the New Action area for Dispatcher’s to use. Display In Handheld: Opens the issue type access for handheld users to access and use. Display For Web Users: Allows resident/tenant/web users to select the issue type. Auto Close When Created: Using this option will auto close the issue type only when created from the handheld reporting device. Restrict to Checkpoint Only: This allows a checkpoint scan to tie to an Issue type without including it in the drop down options for the officer. These issue levels will appear throughout the system including the Issue Monitor and multiple reports. 8. Add Issue Type - click to save the newly created issue type.